Get it while it’s hot! Sign up to our newsletter for all our freshest jokes and content. Straight to your inbox. Burq Off! 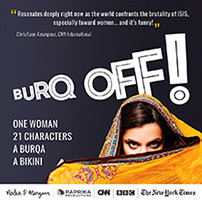 One Woman, Twenty-One Characters, A Burqa, A Bikini. Burq Off! is an autobiographical coming of age story about a British Pakistani girl trying to find herself in a world of conflicting norms. Nadia was raised as a cultural yoyo, bouncing between the expectations of her conservative Muslim family and her saucy British school friends. Love, lies, a burqa and a bikini. Nadia has no idea who she is, but she’ll try anything to find out.